A pretty floral-edged tablecloth made to celebrate the coronation of Edward VIII - floral emblems and the coat of arms. I wonder what the stitcher thought when he abdicated? She didn't undo her stitching and change the king's name; and she didn't finish it. It was apparently found wrapped in newspaper in an older lady's home. 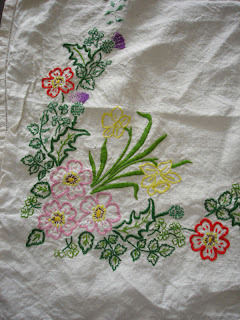 Measures approx 32inches square. 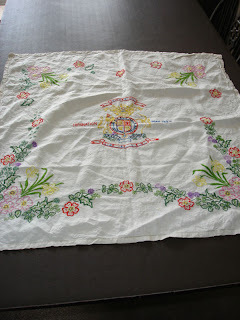 Probably sold as a pre-printed tablecloth with the edges already hemmed, just needing embroidery. I wonder if there are almost-identical examples with George VI on them instead of Edward VIII? If you know any more about the source/designer/publisher/producer of this design, please do leave a comment to add to the information available here. I have a few similar cloths for GeorgeVI but have never seen one for Edward. Either the stitchers unpicked them or put them away and lost heart to finish them. All blog comments are moderated (to catch spam). If you don't want your comment published (eg. you';re including an email address) then please indicate that. Your links, ideas and (copyright free) images are welcomed - I'd like this site to be as comprehensive as possible. Thanks! 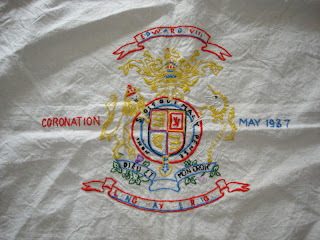 The focus of this blog is British patriotic samplers and embroideries, especially those from 1901 to the present day. Its purpose is to be a catalogue/reference of the remarkable array of these hand-made works. 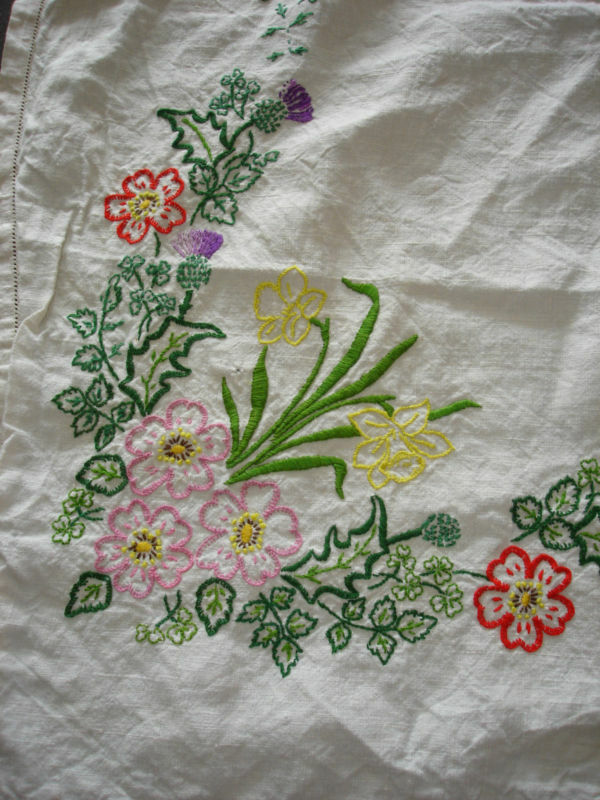 Each one is a piece of social history, someone's time and skill and heart-felt emotion stitched to commemorate an event to which they must have felt a strong connection. If you know of examples not yet here, or further sources or links which could be added to this site, please do leave a comment. All comments are moderated (ie. not published automatically). You can also contact me at rooruu ATgmail DOTcom (remove spaces, replace words with relevant symbols). 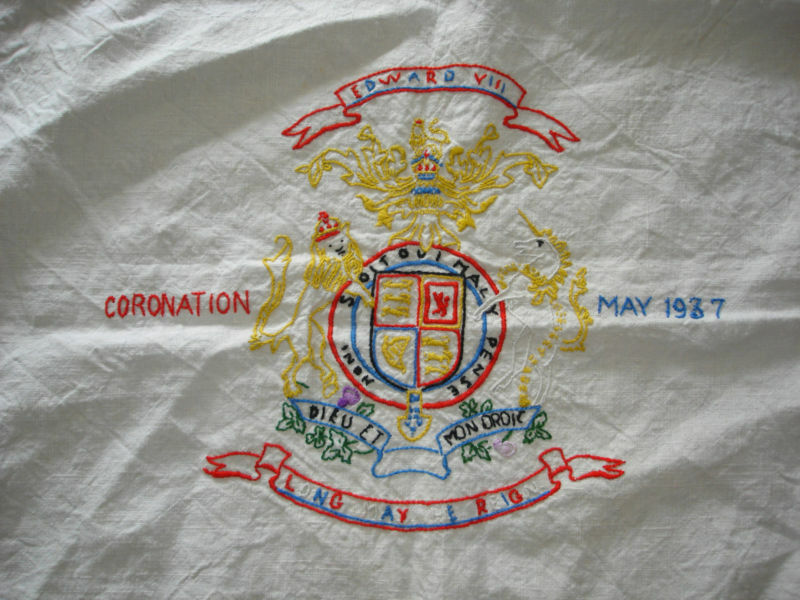 The general world of royal and patriotic memorabilia is huge, and the focus here is very narrow; I'm not so much a royalist as a student of social history and needlework. Every one of these items has a story.